Jack Beattie, Marlene Pearce, Beverly McDade, Janet Vincent, and Ian Elliott at the Adelong Hen’s Shed on Tuesday. At the Men’s Shed building on Lockhart Street, Adelong, change is in the air. Instead of the usual bunch of experienced blokes, on a Tuesday the machinery is operated by female novices, that have taken to the idea of a Hen’s Shed like ducks to water. Some women are building bird feeders for the Men’s Shed to sell. Marlene Pearce is putting together hat racks made of old stockyard rails and railway bolts to sell at Rustic Creations, and Janet Vincent is building a new mailbox. “I’ve been doing it for a couple of months, but I’ve had a lot of help with what I’ve been doing – the men have been great, helping me out and showing me the tricks of the trade,” said Janet. 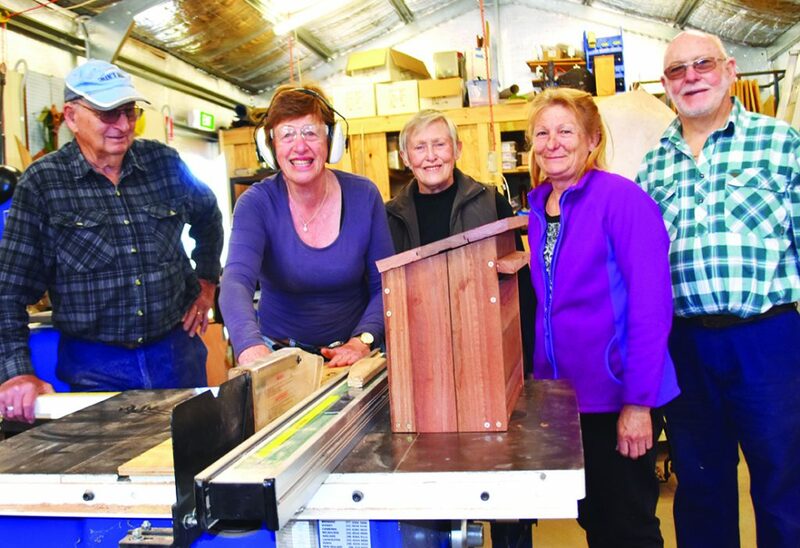 The Hen’s Shed started up in Adelong about two months ago, after declining membership led to fears the Men’s Shed would close altogether. The all-blokes version still runs on a Wednesday, and on Tuesdays local ladies have begun to learn the tricks of the trade. “It’s so I can learn to fix things at home,” said Janet. “My current mailbox is sitting along the side of the fence at the moment with a nail in the bottom, wobbling…it’s going to go one of these days. But when this mailbox is done I’m going to make a birdfeeder out of the old mailbox, so I’m recycling all the time. As for Adelong Men’s Shed founder Ian Elliott, he’s thrilled with how things are going. “It’s going great!” he said. The Hen’s Shed currently have eight female members, and anyone is welcome to join – from absolute beginners to those experienced with woodworking and metalworking. They meet on Tuesday mornings at 39 Lockhart Street, Adelong. For more information contact Ian Elliott at 0428 474 333.